New Page — Panorama Windows, Ltd.
Windows serve a critical role in the design of a building. For this reason, our engineers design windows to not only look and perform to the highest expectations but also to enhance the integrity of your building or home. At Panorama Windows, we design each window for maximum functionality and aesthetics — from ease of operation, insulation, and noise reduction to enhancing the beauty of your building and views. Our Engineering Department is compiled of highly skilled professionals: Engineers and Draftsmen. 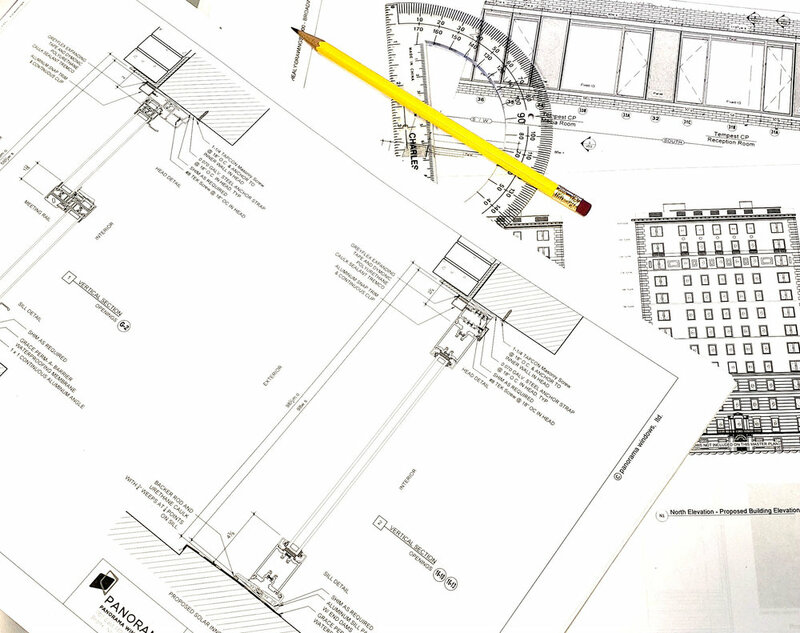 They conduct all necessary field measuring and provide shop drawings for review and approval prior to fabrication. New York City has a nearly 34,000 historic buildings within the City’s 141 historic districts. Panorama Windows has extensive experience working with New York City’s Landmark Preservation Commission. With our wide selection of products, we can recommend the perfect solution for your landmarked building. Our services include preparing applications for permit filing and if required, representing the project at a public hearing. Landmarks can be a complicated and lengthy process, but with our experts we will make sure that it will be done correctly and in the timely manner. Panorama Windows specializes in new or replacement window installations in New York City. Panorama’s product portfolio includes an award-winning fiberglass casement windows as well as top-of-the-line aluminum double hung and unique in-swing casement pivot windows products by our manufacturing affiliate, Tempest Architectural Products, Inc. Tempest windows have a quiet elegance - their minimal frame width and simple lines allow them to blend in with traditional, contemporary, or landmarked surroundings -- and are fabricated with great care and precision. Also, as a dealer, we provide our clients with a wide variety of window styles from a number of the country’s top window manufacturers. Panorama Windows Service Department has a team of trained technicians who are dedicated to servicing and repairing windows in New York City. We service not only our windows but also the ones from other manufacturers.